This 11th century church replaced a 7th century structure that in turn had replaced a roman temple. The courtyard (Lichhof) at the east end shown below covers an ancient burial ground. The statue on the right is a memorial to those who died in World War II. Like several other churches in Cologne, this church was built for the use of a Benedictine cloister founded by Archbishop Bruno, brother of Kaiser Otto I. 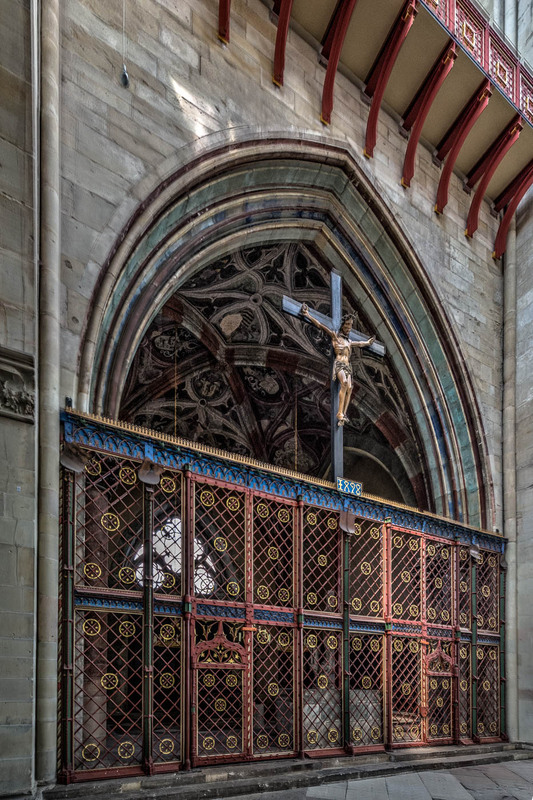 The public entrance to the church is through the cloister (19th, 20th century construction). The church was severely damaged during WWII. Once elaborately painted, it has been restored to the simplicity of the early period of its existence. The ceiling of the nave is a modern replacement for the destroyed stone vaulting. 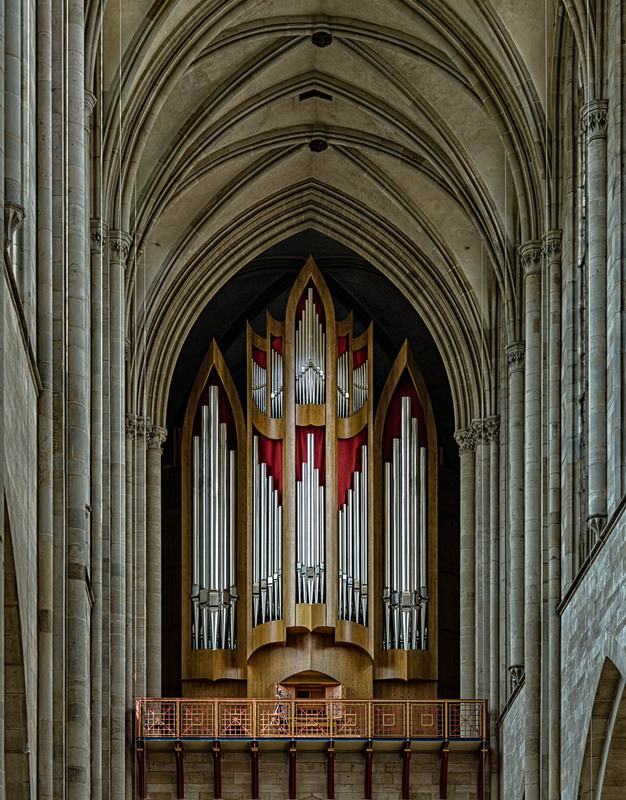 The late gothic rood screen, seen from the west above and the east below, forms an elaborate boundary between the simple nave and the elaborate cloverleaf form of the choir. Carvings in the marble represent various Biblical scenes as well as the coats of arms of donor families. The choir has a cloverleaf or trefoil form with three large apses and the crossing which together form a large open space. Based on the design of the Church of the Nativity in Bethlehem, St. Maria im Kapitol became the model for other churches in Cologne. The windows, though modern, portray archbishops, abbesses and saints of importance to the early history of the church. The side aisles of the nave connect to an ambulatory surrounding the chancel space. Walking the aisles reveals a kaleidoscopic variation of lines and curves. 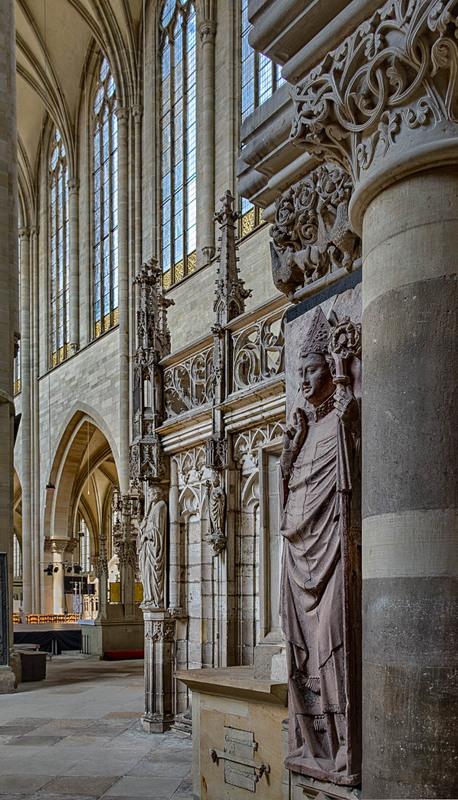 The cathedral at Aachen incorporates more than 1200 years of history into one building. The heart of the church is the octagonal Palatine chapel. It was built during the reign of Karl Der Große (Charlemagne ca A.D. 800) as a two story church. Many renovations, demolitions and expansions have produced the current structure. Thirty kings and twelve queens were crowned here over the centuries. The image above was taken from the original chapel looking toward the 14th century choir that was modeled after Ste. Chapelle in Paris. The reliquary or shrine in the lower center reputedly contains the robe of Mary, the swaddling clothes and loincloth of Christ, and the beheading cloth of John the Baptist. The shrine is opened periodically for viewing. The image below shows the verticality of the original chapel. At the time of construction it was the tallest building north of the Alps. The mosaic in the ceiling is a 19th century creation in the mode of medieval mosaics. Some of the columns are thought to have come from Rome. The 12-sided chandelier hanging from the roof represents the heavenly Jerusalem. It was donated by the emperor Frederic Barbarossa in 1165. The arches and vaults of the ambulatory around the chapel shift kaleidoscopically as one walks around. In this view of the church, the Palatine chapel is bracketed by the gothic addition and the Gothic superstructure over the original narthex. The choir, with its stained glass walls, contrasts with the heavier central chapel. The reliquary at the bottom of the photo is reputed to contain the bones of Charlemagne. At the very least it contains the bones of a tall man who died early in the 9th century, so the tradition has credibility. Dedicated to St. Andrew, this church lies a short block from the more famous Cathedral of Cologne. The nave, aisles and west end were built between 1180 and 1245 in the romanesque style. The choir and apsidal transepts were added in the 15th century in the high gothic style. The choir is longer than the nave, almost making two churches that meet at the crossing. Yet, the overall effect is very unified. This church is the repository of some remarkable relics (giving them the benefit of the doubt for the moment). St. Andrew’s arm bone is reputedly contained in a reliquary in the apse of the choir. The south transept holds a 16th century gilded reliquary that reputedly contains the bones of seven Jewish brothers and their mother. The apocryphal book of 2 Maccabees records their torture and death at the hands of Antiochus. 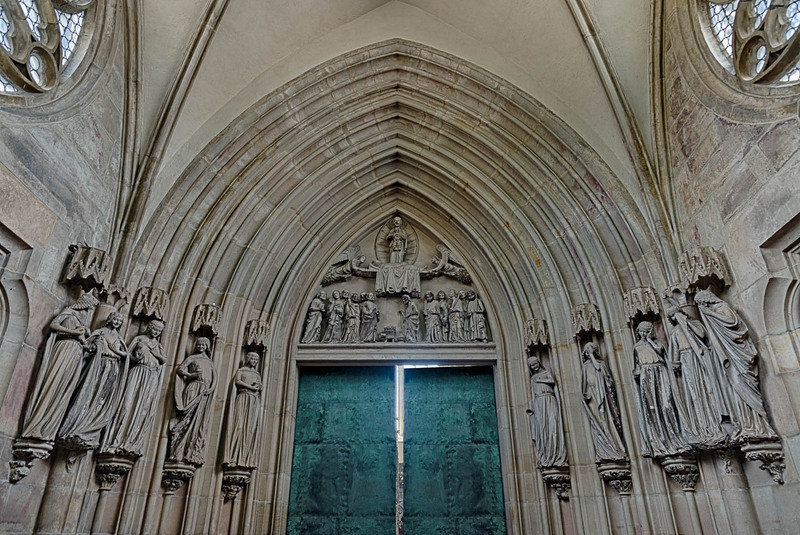 When the synagogue near which they were buried was converted to a Christian church, their bones were recovered and eventually found their way to Cologne in 1164. When the choir was built, the crypt underneath was sealed up. After WWII, the crypt was reopened and renovated. A chapel was opened up underneath the crossing to house the relics of Albertus Magnus, a Dominican scholar and scientist of the 13th century. The sarcophagus is a roman artifact once held at the nearby St. Ursula church. Albertus was canonized and declared a Doctor of the Church in 1931. As unique as the shrine of the Jewish martyrs is, the reliquary in the vestibule (with St. Andrew in the background) is perhaps the strangest. I thought at first it was a baptismal font. It is in fact supposed to contain the blood of the virgins who were martyred with St. Ursula in the 3rd or 4th century. 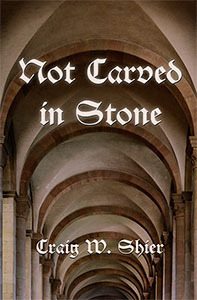 The stone “font” itself is 16th century. The unique decagonal nave of this church opens to east into a choir which was completed about 1156. Much of the original furniture was destroyed in WWII and the structure required significant repairs. Yet the heavy, round-arch, romanesque design elements are evident. The apse retains most of the original wall paintings, including the enthroned Christ, St. Gereon, and a bishop brandishing a sword. The windows are modern. Opening off the south side of the decagon is a baptistry built 1242-45. By that time the gothic style had taken hold in German lands. The font itself is of a somewhat earlier date. Opposite the font is a late gothic altar. The wall paintings date to the mid-13th century, about the time of construction. 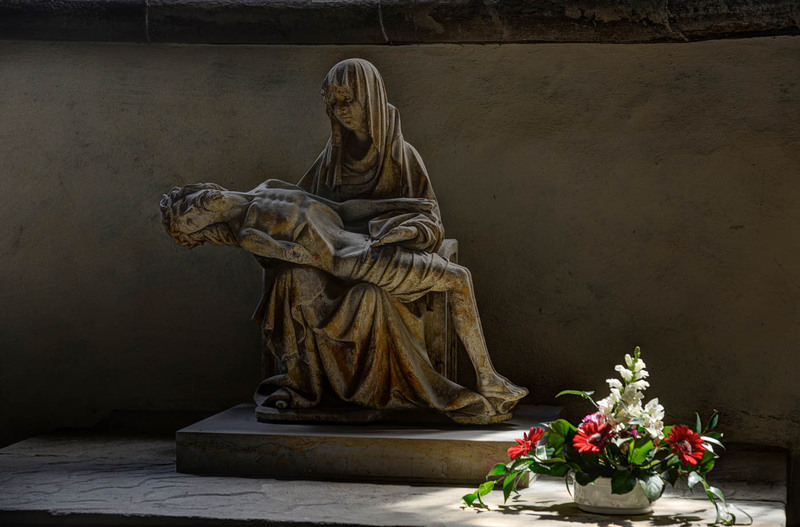 One of the most striking features of the church is a chapel with a 19th century pieta. Although the gilded vault and variegated marble panels are eye-catching, the monochrome sculpture stands out even more. St. Gereon Kirche is unique north of the Alps. The lower levels date to about 350-65. The central structure is oval with semicircular niches that may have once held memorials to early noble families. Some of the stone in the vaults of these niches was recycled from Roman structures. The upper portions of this structure were renovated and extended several times during the past millennium. The visual splendor can only be approximated in photos, but this view of the ceiling gives some idea of what it is like to stand in the center of this remarkable church. Each of the niches mentioned has a different pieced glass window. Here are a few of them. 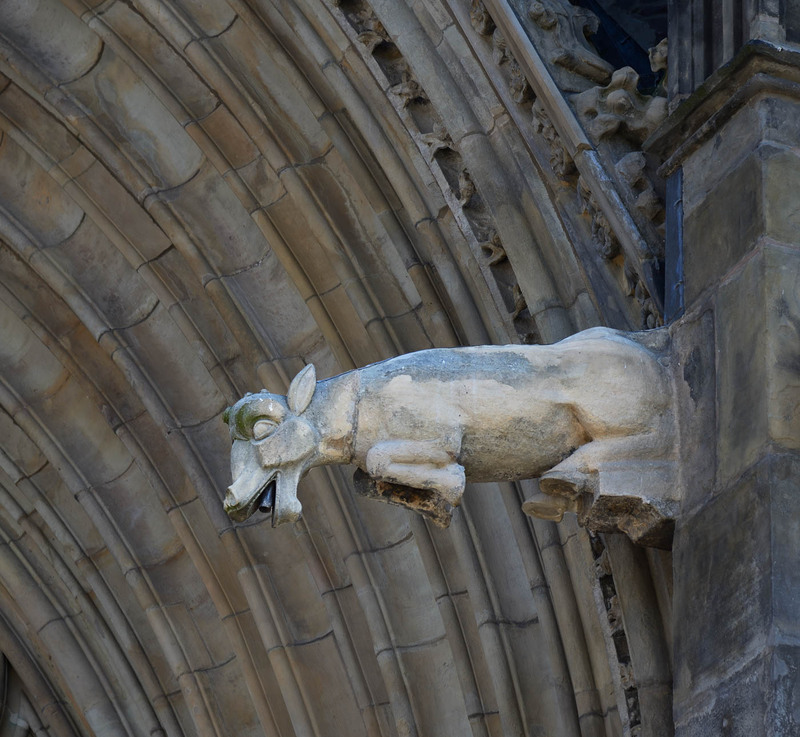 They are just another indication that modern ideas of unified design did not obtain in the Middle Ages. A fascinating aspect of these ancient churches is the stories they have to tell about the people who inspired them, built them and worshipped here. St. Gereon was, according to tradition, one of fifty Roman soldiers from Egypt who were beheaded for refusing to deny their Christian faith. They were thrown into a well on the site of this church. Excavations after WWII failed to locate such a burial, but there are sarcophagi here from Roman times. These same excavations uncovered coins minted after 345, disproving the tradition that the church was founded by St. Helen. However, it is certain that the main oval structure was begun during the 4th century. This sculpture of Gereon´s head is in the park adjacent to the church. It weighs 8 tonnes and measures about 8 feet from the neck to helmet. An international project in some sense, it was created by a German-Turkish sculptor in Thailand.